If you like cauliflower cheese and you like broccoli too, then this recipe makes an unbelievably delicious way to combine the two! The great thing about this recipe too, is that you don’t have to use fresh cauliflower or broccoli, it works just as well with frozen and to top it, frozen is at least half the price of fresh cauliflower and broccoli. But do buy a reasonable brand, it is worth trying out a few to see who has the best quality, as sometimes you can get a bag of small pieces and broken bits! Of course I am unlucky in that my kids neither eat cauliflower or broccoli, but I love serving this up as a side when we are grilling, especially as the Germans I know don’t know this dish. You always want to have more cauliflower than broccoli as it is basically cauliflower in a broccoli cheese sauce! In a pan melt the butter and crush the garlic into the butter. When the butter has melted, stir in the flour and make a rue or paste, then slowly pour in the milk, whisking as you go, until you have a lovely smooth sauce. 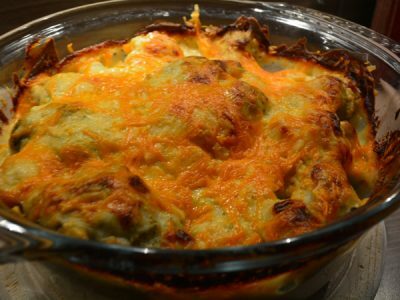 Arrange the cauliflower in an appropriately sized baking dish (cut into florets first, if using fresh), pour over the broccoli white sauce and grate over the remaining Cheddar. Blitz the bread into breadcrumbs in a food processor, then pulse in the thyme leaves and almonds. Toss with a lug of oil and a pinch of salt and pepper, then scatter evenly over the cauliflower cheese. Bake for 1 hour, or until golden and cooked through, serve with some lovely grilled pork chops!